I was looking through old pictures and found this one interesting one. Then I realised how it had been a while since I posted any pictures and thought it was a perfect time for this! 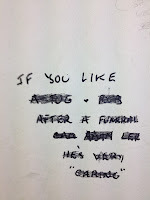 It's a piece of rather amusing graffiti I found on my way into a hospital morgue once upon a time. It was located on the way to a mortuary at a certain hospital. Specifically it was just on the inside of the hall where we parked the transfer van. This made it one of the first things you would see as you entered the building via this door. A door mainly (perhaps even only) used by undertakers. So it is a message obviously meant to be read by undertakers. This graffiti is also written by an undertaker as illustrated by the certain names and words which few outside the industry would know. Unfortunately I can't make out everything, the fifth word escapes me. But from what I can work out the text reads: If you like a tug [heart] ?O? ?B after a funeral call **** *** he's very "caring". Obviously I cannot say who the graffiti refers to even if you can read it. Just as I cannot say which funeral company I think it is talking about even if it is clear to some. The cryptic and humous message was written by an undertaker and is meant for other undertakers. It sums up many attitudes within the industry quite nicely. The amusing and playful poke at another in the industry. Also how inappropriate people can be. That being an undertaker is not 'special' but a job like any other and people are people no matter what they do. There are so many playful pranks in the industry. It also shows how the way the industry is slightly closed to outsiders and yet very gossipy and chatty to those who belong to it. That someone outside the industry would not understand the message as much as those who work in it. Being an undertaker is not simply a job for most but also part of being in a group. This is something I have also found outside the industry. When I talk with others who are or were in the funeral industry there is instantly a bond. We talk of things with each other that we would not mention to others. It is the same with those in the medical research field, although to a lesser extent. There is a certain kinship or bond from working in this kind of industry. The same as those who were or are in the armed services share a bond. 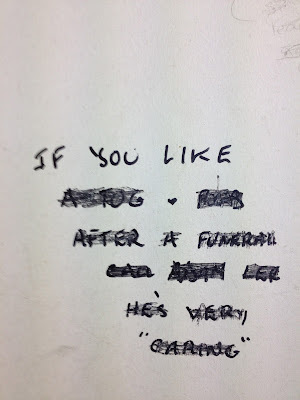 Either way, there is an old photo I found of some graffiti. And how it summed up the industry to me in many ways.